“There are a lot of vets,” Dr. Dolittle said. “Yes, please,” Dr. Dolittle said. He opened a drawer and took out a notebook and pencil. “Will you teach me the parrot’s ABCs first?” he asked. ー Hugh Lofting, Doctor Dolittle , Compass Publishing, 2009, p.7. 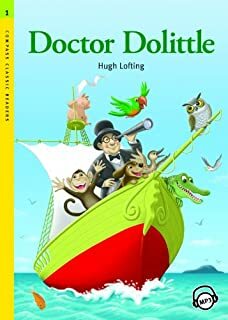 ー Hugh Lofting, Doctor Dolittle , Compass Publishing, 2009, pp.7-8. ー Hugh Lofting, Doctor Dolittle , Compass Publishing, 2009, p.14. ー Hugh Lofting, Doctor Dolittle , Compass Publishing, 2009, p.19. The monkeys knew of such an animal. It was a pushmi-pullyu. It was like a cow, but it had a head at each end. “How does it make up its mind?” the duck wondered. ー Hugh Lofting, Doctor Dolittle , Compass Publishing, 2009, p.28. You owe a lot of money in Puddleby. Take the push-pullyu home, and people will pay to see it. You’ll soon make a lot of money. Gub-Gub, Polynesia and Too-Too stayed behind. They had returned home to their land. They stood on the shore crying and waving until the boat was out of sight. ー Hugh Lofting, Doctor Dolittle , Compass Publishing, 2009, p.30.